Without reading the title you may see these images and instantly think of Youtube and yes... it is about my favourite youtubers, or should I say, the youtubers I watch regularly! I've been part of youtube for so many years now, since 2008! However I'm too shy to film, maybe it's something I would do in the future. But back to how long I've been on youtube, I've followed Zoe's blog as well as her youtube account. I was also excited to see a new Primark Haul uploaded regularly and I've seen her grow, like so many others to be so successful. The one thing, that makes Zoe so interesting to watch, is that she is always so engaging with her viewers, she is always a joy to watch so that's one of the main reasons as to why I watch her regularly. I have to admit, I didn't know who Alfie was until I noticed that he was close with Zoe! I'm more intrigued with his vlogs, as he always has a smile on his face and can make the simplest video so comfortable to watch - he is just full of life! I found this gem on Pinterest - social media helps so much! Once discovering her youtube channel and following her on Instagram, she too has quickly become a favourite of mine. Every make up looks is effortlessly stunning and precise. She joined last year and already she is so successful! Zoe's brother, Joe Sugg... well he has me in stitches all the time. The numerous pranks his plays on his friends. He is so creative and commical all of the time, you can't not like him! Ingrid Nilsen, seriously so beautiful and cute! Again she is so engaging, I think that's what I look for in youtubers don't you think? It's so important. She makes her videos fun! And her new hair style is stunning on her. Her channel also provided a lot to watch, from make up to food! 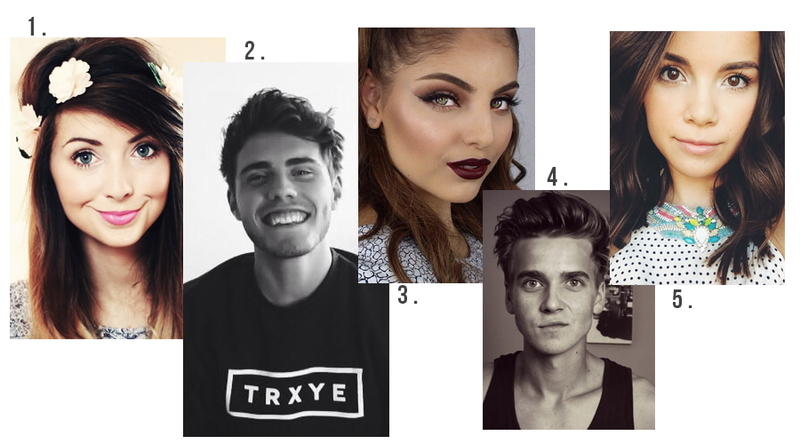 Who are your favourite/most watched youtubers? I love all these you tubers but haven't heard of HeidiHamoud before - going to have to check her out! Btw I have nominated you for the Inspiring Blog Award over on http://bdazzles.blogspot.co.uk/2015/01/chit-chat-giveaway.html ! !